The Eighth Doctor is a box set machine these days. Pretty much has been since his Fourth Series of "Eighth Doctor Adventures" ended it's run in 2011. Since then he has had four box sets under the Dark Eyes moniker, another four titled Doom Coalition, and more recently began a new line taking place nearer the end of his lifetime simply titled The Time War. 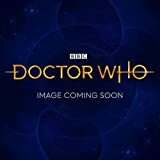 While Big Finish is producing The Time War, They are also continuing the story of The Eighth Doctor along with his friends Liv Chenka and Helen Sinclair (his companions throughout Doom Coalition) with Ravenous. This is the second box of that series, so unlike The Time War which is jumping closer to the time of the Eighth Doctor's regeneration as seen in Night of the Doctor, this one essentially carries on his adventures that really began back in 2007. Ravenous 2 begins with Escape from Kaldor which has the Doctor return to Liv's homeworld, where they end up again battling killer robots and reunite Liv with her estranged sister. It's a decent enough episode, plants some seeds of things to come, but I won't claim it was the best opener to a set. It felt like the family ties to Liv weren't perfectly conceived. The episode also lacked a certain energy it needed to kick this new set off. Luckily, things kick into a more interesting gear with the second story, Better Watch Out. This story is more Christmas themed, and since the episode that follows continues that storyline...it made me wonder why they released Ravenous 2 in October, instead of waiting until December. At any rate, the story involves the Central European Christmas monster, the Krampus, who is essentially the anti-Santa Claus who steals the bad children away. Krampus has had a bit of a pop culture jolt in recent years, with a pretty entertaining Christmas themed horror movie in 2015 (simply titled Krampus) as well as a slew of direct-to-video schlock in the last 5 or so years. So Big Finish feels, in some ways, a bit late to the party. Though their entry into the party is actually pretty darn good. The Doctor takes Liv and Helen to Salzburg for their annual Krampusnacht event, but unfortunately, the bit of holiday fun falls apart when Krampus becomes real and begins to take all of the bad people in town. This particular adventure spreads across two episodes in the set, concluding in Fairytale of Salzburg. That episode sees Krampus fought off by the ingenuity of the Doctor's companions and his historical opposite. It's a good epic tale, and in some ways, I wish the entire set had been based around this one story. Expand it in some places, end in Salzburg, then set up for the next boxset. Then you'd have a pretty fun four hour Christmas adventure. Instead, the set comes to it's conclusion with Seizure, which brings the Eleven back into the fold. The Eleven sends the Doctor a distress call, and the Doctor decides to answer the call, knowing that with the Eleven it could very well be a trap. The Doctor lands inside the Eleven's TARDIS, but it is a labyrinth that begins to separate the Doctor and his friends...and a frightening beast is aboard. The beast is the titular Ravenous, first mentioned in the first box set, and making it's first actual appearance here. It's a monster that feeds on life energy, constantly hungry for more...with it's favorite meal being Time Lords. I think it is a cool monster, and this first glimpse is promising...though part of me wonders how much depth a monster like this can have, especially if it is to be the main antagonist of this particular series of boxsets going forward. All in all, this is a pretty good boxset. While the first story didn't really grab me, the rest of the set is a lot of fun. While I enjoyed the eerie closing episode that marked the first appearance of the Ravenous, I still kind of think the whole set would've worked better if it had focused more on the whole Krampus story. I think there was more to explore in those episodes, they had a lot packed into them, and the opening episode being dull, and the final episode felt like it belongs to a bigger story yet to come...I might've just enjoyed a Krampus set. Still...McGann always delivers as the Doctor, and any set starring him is worth a listen. Paul McGann (The Doctor), Nicola Walker (Liv Chenka), Hattie Morahan (Helen Sinclair), Mark Bonnar (The Eleven), Ian McNeice (Sir Winston Churchill), Laurence Dobiesz (Wilhelm Rozycki), Gyuri Sarossy (Jan Ostowicz), Tracy Wiles (Secretary / Ground Control), Beth Chalmers (The Heliyon), Roger May (Cornelius Morningstar / Verdarn), Judith Roddy (Stralla Cushing), Sarah Lambie (Gorl), Jane Booker (Dron / Yetana), Christopher Ryan (Macy), Nicholas Rowe (The Kandyman), Amerjit Deu (Governor), Charlie Condou (Crabhead / System / Jarl), Pippa Bennett-Warner (Ruzalla), Beth Goddard (Ludina Braskell). Other parts played by members of the cast. Following on from the events of Doom Coalition, the Eighth Doctor and Liv Chenka are attempting to find the trail of their lost friend Helen Sinclair, and they begin a brand new set of adventures to stretch out over four boxsets, this time with the umbrella title Ravenous. It's a pretty exciting new beginning for this Eighth Doctor team, and bodes well for the Eighth Doctor adventures going forward. The set begins with Their Finest Hour, which has The Doctor and Liv answer a call from Winston Churchill, who hopes that the Doctor can solve the issue of an invisible ship that is wiping out his Air Force. It's a energetic start to this set, with Paul McGann in his regular fine form as the Eighth Doctor, and Nicola Walker far more settled into the role of Liv. I must admit that while I really enjoyed Doom Coalition, I have never been too excited by Liv as a companion. She just seemed too low key, but I felt Helen picked up the energy where Liv seemed to drag. Here, she seems far more comfortable in the role, she just has more energy and her sparring with the Doctor had a good flow to it. At any rate, the opener sets the tone nicely, with World War II and interferring Aliens, a good supporting cast (including Ian McNeice reprising the role of Winston Churchill), and a good mix of action adventure and character moments. The second story, titled How to Make a Killing in Time Travel, has the Doctor and Liv again diverted from finding Helen, and this time end up embroiled in a murder mystery and a prototype time machine. This is a pretty fun story, lots of humor and asort of madcap pace. These first two stories seemingly have little to do with the big new arc that will be the backdrop of the coming Eighth Doctor boxsets. I've been fooled before, they may end up playing a bigger role than I realize...but even if they do not, they were a fun couple of stories that kept me engaged and reaquainted me to the Eighth Doctor and Liv...and they made me appreciate Liv more than I had in the past. Helen, along with the Eleven, make their return in World of Damnation. The two apparently crash landed in an asylum, and Helen wreaked some havoc when they arrived, apparently endowed with some powers from the Sonomancer (Listen to Doom Coalition 4). But now she is just trying to calm the Eleven's psychopathic tendencies, and it is seemingly helping. Also at the asylum is the Kandyman (making his audio debut), who is distributing sweets to the inmates, which somehow controls their behavior. By the time The Doctor and Liv arive, the asylum is in chaos, and I rather liked that while the Helen and Eleven storiy is being told simultaneously as the Doctor and Liv arriving, it builds in a way that you only slowly come to relaize that the TARDIS arrival actually takes place some time after the rest of the episode, and that the chaos has been instigated by the Eleven and the Kandyman, who were secetly working together. Despite having spent so much time searching for her, the Doctor is very suspicious of Helen once they have found her, and he is unsure of her motives throughout most of the finale of the set, Sweet Salvation. In this episode we discover that hte Kandyman and the Eleven plan to rule over whole worlds by delivering the Kandyman's confections as a mind control device, and it is up to our TARDIS team to halt their plans. This finale is a great conclusion to the set, as it while the titular Ravenous is only briefly heard and hinted at, I am intrigued about going forward. This set is a good start to the new set of adventures for the Eighth Doctor. It definitely helped me warm up to Liv, which is a definite plus, as I really never found her that interesting in previous boxsets. I do find it surprising that they brought the Kandyman back at all, as I don't think he actually worked in his lone TV appearance. But Big Finish manages to make him a more interesting character, with a brand new design on the covers, because I am pretty sure there was some copyright issues with the character design. I should also make special note of Mark Bonnar as the Eleven, who has been incredible in this role since the start of the Doom Coalition sets. If I have a criticism of this new set, it is that it really cannot stand on it's own. You have to have listened to Doom Coalition to understand major plot points of this set. Despite carrying on from Dark Eyes, you could have started fresh with Doom Coalition, that is not the case here. Now, that previous series of boxsets is pretty entertaining, so it is kind of worth it, but those who are not fairly familiar with the ongoing adventures of the Eighth Doctor on Big Finish, you should probably catch up to start this new set of adventures. Those who are fmailiar? This seems like a fun new collection to add to a growing list of fun collections for Paul McGann and company. 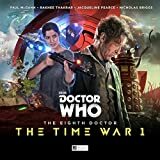 Paul McGann’s Eighth Doctor has enjoyed something of a resurgence in recent years, most notably, in audio, via the Dark Eyes and Doom Coalition sagas. Now, however, we journey back into a period of The Doctor’s canon that is largely undocumented compared to his classic incarnations, namely the war between the Daleks and the Time Lords, more commonly known as the Time War. The eerie opening of this first episode evokes a time when Doctor Who, as a show, was less about the complicated story arcs and more about cybermen with silver foil suits. However, with cinematic ideals close at hand, we join a commander of a squad of Time Lords on a mission that, at this point, still leaves us in the dark. After an opening theme with sweeping orchestral tones, we are then hit by the comic relief of ending up in an unexpected scenario. Specifically, in a broom cupboard with The Doctor and an unfamiliar individual who is, ostensibly, his companion. As per usual though, the unfamiliarity with characters is quickly surpassed by the potential for comedy, curiosity and confusion, even if things seem to remain unclear for a while. Eventually, however, the confusing and seemingly tenuously linked threads do converge and not really in the way you would necessarily expect. Not wishing to spoil anything, the opening story of this box set, whilst it starts off rather mundanely in comparison to some, has a conclusion that is worth waiting for. This episode starts out with a rather comedic opening that, like the story preceding it, seems to share vague similarities with The Sirens of Time. It also serves to make sure that the Daleks are in the foreground, as they rightly should be given the subject matter. The jungle world that The Doctor and those traveling with him land on is nowhere near as peaceful as they might like. Various elements of adumbration direct Whovians familiar with Dalek history to a particular train of thought that is unfortunately not explored further or quelled in any way. Rather than an action-packed chase through the undergrowth, this is an interesting exploration of the impact of the Time War on those not directly on the front line. Briggs’ delivery of the Dalek lines is almost certainly the highlight of the episode, with the insight into the psyche of The Doctor’s greatest enemy being interspersed with moments of reflection on just how volatile that foe can be. We also gain a partial insight into the Time Lords determination to eliminate any opposition, regardless of the end result. Instead of being a standard Doctor and an enemy story, this continuation introduces us directly to the Gallifreyan army and their training regimen. References to some of The Doctor’s television appearances are very much appreciated, with confident scriptwriting and delivery showing a great difference between those fighting the Time War and those caught up in the chaos. Whilst plot-wise, strictly speaking, very little actually happens, we as the audience get to see new sides to The Doctor and the Time Lords as a whole. Regardless of opinions on the actual plot of this episode, the resultant cliff-hanger is worth the wait. A so far linear story now takes a turn into the confusing, with the concept of a Time Lord weapon and it’s ramifications on the timeline. Interspersed with flashbacks of two characters new to the Whoniverse, this final episode is very much the interesting denouement that is expected, even from a first box set in a series. A well-formulated script, with several interesting twists and turns, combined with a cast who deliver their lines with a flare to bring this story to fruition. This installment, if nothing else, shows promise for the rest of the exploration of The Eighth Doctor’s adventures during the Time War. This final collection of the Eighth Doctor's run in Doctor Who Magazine is a solid set of stories, but being that they did some standalone stories with the Doctor travelling on his own, and then began a new set of adventures with Destrii that ended up being cut short (though ended nicely in the epic "The Flood"), it just doesn't have the same kind of flow with build up and payoff that the other collections had. The other Volumes really do feel like a thought out season of Doctor Who. The final volume felt like some assorted adventures of the Eighth Doctor with no real running arc, which probably wouldn't have been the case had the new show not returned and probably cut short their initial plans for Destrii as a companion. She had only really gotten started in the final story. So there is a bit of disappointment that Scott Gray could never truly finish his storyline there. Complaints aside, I highly recommended finding a copy of each Volume of the Eighth Doctor's DWM comic run. They a lot of fun to read. I had enjoyed going through the Fifth and Sixth Doctor's run (though the Sixth Doctor's seemed to run out of a bit of steam in it's second volume), but the Eighth Doctor's was great, no doubt helped by the fact that they were totally free from the show being on the air, and they decided to find one writer to really focus and write the bulk of the scripts at the time. Highlights in this volume include the opening story "Where Nobody Knows Your Name" which is a short one-off that has the Doctor and a Bartender discussing life, with the Doctor still a tad wounded from Izzy leaving him, and the Bartender helps the Doctor decide to carry on, with the comic revealing in the final panels that neither man knew who he was conversing with, and the bartender was actually Frobisher. Another great little story is the lovely "In the Land of Happy Endings" which is a tribute to the old TV Comic stories of the First Doctor's reign, drawn in that style with original comic companions John & Gillian. It is sort of goofy, but with a poignant ending. The aforementioned "The Flood" is another highlight for this book. An interesting bit found in the commentary section was that Russell T Davies was such a fan of the strip, that he even offered to let them show the regeneration of the Eighth Doctor into the Ninth...but after certain rules put in place by RTD and the BBC took hold...it ultimately came down to DWM deciding it might be best to just not have the regeneration (they couldn't show Eccleston prior to him being on TV, they could only show him with Rose, and they couldn't even do one story with the current companion of Destrii staying on with the Ninth Doctor)...so they decided against it, and in the end have McGann not regenerate into Eccleston in the strip, instead they have The Doctor and Destrii walk off into the sunset after a chat about the importance of change, and that they really have no idea what could lie just over that hill. It is actually a rather brilliant ending. It ends this rather consistent and phenomenal run for the Eighth Doctor in the comics (and that run lasted 9 years) very well. It is a happy ending, one that leaves the potential for more adventures while subtly acknowledging that those adventures do not lie within the pages of the Magazine anymore. And quite frankly, not having the regeneration means we got The Night of the Doctor...and who would ever want to lose that (and having read the script for the alternate ending that they put in this collection...it doesn't hold a candle to what Moffat eventually gave us). So I am glad they went with the ending they did, I can see this Doctor continuing on to have more adventures, probably going on to meet Charley and C'rizz and Lucie and so on in the Big Finish tales. I'd rather his adventures here lead to more adventures than to a definitive ending. While the unconnected stories and the seemingly unfinished Destrii storyline don't make this collection as strong as the previous Eighth Doctor collections, there is still much to enjoy in this book, and The Flood is a fine ending to his excellent run on the strip. The Eighth Doctor's third volume of his Doctor Who Magazine days is collected in the rather great Oblivion, which kicks off from the moment the strip went to full color, and also features the final arc featuring the Eighth Doctor's companion Izzy, who joined at the very beginning of his comic run. I have to say, the plotting of story arcs within small stories with big old payoffs at the end, really feel like a forerunner to the format of the show when it finally returned to TV. Since Davies was a fan of the strip, it's possible he read these strips and saw something of how the show could work for modern TV. The major storyline in this book involves the struggles of Izzy, who has her body swapped with an alien named Destrii in the opening story...and when it seems her own body is destroyed in an explosion...she is now stuck as a bluefish lady forever. This storyline has some great moments, from the colorful explosion that is the opening "Ophidius," to the more subdued and sad "Beautiful Freak" in which Izzy deals with the initial fallout of what's happened. She slowly starts to deal with her condition, but then she is taken by Destrii's family, who kidnap her and take her to Destrii's mother. The Doctor has to enlist Fey/Shade to try and track down the kidnapped Izzy, and in the hunt discovers that Destrii is actually alive and well and still in Izzy's body. He takes the unwilling Destrii to her homeworld in hopes of saving Izzy and swapping her back into her own body. It's an intriguing story and even the stories that seem like a standalone deal in some minor way with the ongoing story arc. It's a well-crafted set of tales from Scott Gray, I may find the conclusion and elements of the storyline of The Glorious Dead a bit more, but I think that in terms of crafted storytelling, this book has a bit of an edge. It's all leading towards Izzy's exit from the strip, and Gray found a great way to build her character towards an ending that feels like a real reward. It is almost a shame to see Izzy go, perfect companion material, but she had a good long run, and her arc really came together beautifully in the end...the timid girl who loved sci-fi and struggled with the fact that she was adopted, and by the end of it she is stronger, is far more confident in knowing who she is, and accepts that her adoptive parents actually love her, they ARE her true parents. I love that early on in her stories there was this red herring of "she doesn't know her real parents" as if that would come into play at some point...but in the end? She realizes that her real parents are the ones that adopted and raised her and loved her all those years. The final few panels for Izzy is beautiful stuff, a lovely end to a companion that I've really grown to love. And I haven't even mentioned that it was revealed that she was gay, which had been hinted at from time to time beforehand, making her the first openly gay companion in Doctor Who. Her time on the strip lasted about 7 or 8 years, certainly one of the longest-running companions in any medium, particularly of the comics, and it was one heck of a run. This book is, as most Panini reprints, wonderfully put together, and the chance to see a well put together storyline in full color makes Oblivion well worth reading.